Paul has an extensive track record in the areas of: Learning Systems Development inc. Artificer Learning (Bush Mechanics), Bioneering, Anticipatory Action Learning, Adult and Community Education (ACE), Strategic Planning, Futures Studies, Business and Organisational Intentionality and Learning. From 2001 onwards, he has been working at Kalgrove1, a company specialising in Child Care and Adult Learning. (The company is about Kids and Adults Learning, and it’s based in a Grove of gum trees – hence the name.) Kalgrove’s philosophy is that learning is an engaged process that comes from the lived life of the student, through a strong practical commitment to helping generate in children, students and communities a Life Long Love of Learning. Paul is also a board member of Golden Years Senior’s Care Centre2, and of the National Federation of Parents, Families and Carers3. He and his wife are also long time members of th Nundah branch of Lions International. From 1989-2001 he worked in the Adult and Vocational Educational area concentrating in Apprenticeships and Traineeships interfaced with TAFE Qld – ultimately ending up as Deputy Commissioner for Training and Director Employment Directorate. Before hand, he lectured in 1994-97 at Southern Cross University where he developed a Master’s specialisation course in Futures Studies (FS) (then the only online version in the world). He has published four CD-ROMs, contributed 10 chapters and some 45 articles in these and related areas. 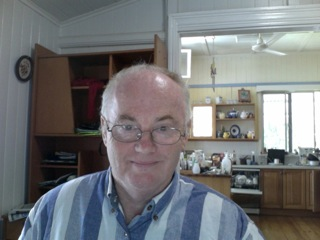 Interests include bike riding, boating, healthy diet, grandchildren minding and spending the past three years on building his own bush mechanic exemplar project in the marine services industry – as well as developing a theoretical and practical understanding of this specific type of advanced Anticipatory Action Learning called Artificer Learning which, in Australia is called Bush Mechanics, and publishing therein. Artificers are the step beyond Artisan and are expert generalists in a number of related fields. They bring a methodical and ingenuous approach to solving everyday dilemmas with an eye to assisting today the development of a better world tomorrow for our children. He has overseas experience in management development and futures including in Tonga, India, Malaysia, Africa and Singapore and Papua New Guinea. Paul can be contacted via email on paul@kalgrove.com . Jim always sought social activism as a way of relating to the world, initiating his interest in anti-war actions, early environmental and community concerns within the urban landscape. He engaged such matters as freeway construction with its division of communities and ineffective and destructive technologies applied to urban transportation and likewise Indigenous issues, although his own cultural community often is the offender. Most recently he helped his local media to revise its implicit racist mindset as applied to the problem of why young Indigenous children use railway tracks with calamitous consequences. A tragedy and its aftermath led to wider community reflection on transport policing. The Indigenous use them to walk to various places – not least because no one else does. In fact, the community learned in this campaign young people do this more widely due to fare costs and service limits. However, in the poorer and often prejudiced white community Jim lives in, this walking led to a calamity which proved just another avenue for denigration of the local Indigenous. Jim’s faith in learning through action was vindicated, if the events deeply saddened and racism proved its vicious presence. Jim’s doctorate is in local history. Jim’s interests in anti-war, environmental issues, women’s and men’s rights and duties took him back to university in later life after stints as taxi driver, Naturopath and Acupuncturist, Asian traveller and would be gardener: even mower of those great symbols of nature’s subservience – the suburban lawn. Jim has also worked in Aged Care for 15 years. However, at University social movement theories, sociology and practices reignited his interest in ideas. He has taught in Australian politics, identity and culture for the last 15 years at several universities while still engaged in Aged Care to a limited but significant degree, which gives him a unique perspective. His hope for the eZine is that it allows others to engage in practice or doing good works (if not necessarily those or only those of Biblical sanction), reflecting on them, finding a forum for constructive criticism and dialogue and building local actions. Giving oneself practical hope and the world meaning, through resistive action and thought seems a worthwhile project given what is around. He hopes that this eZine project will become yours too. 1 http://www.kal.net.au/ This site also contains information about Artificer Learning/Bioneering and Bush Mechanics.